Grasping the need of accurate and transparent accounting in every small or big business today, we, at DNS Accountants, fully understand how important is clear-base accounting for company’s financial matters and growth prospects. With the delightful experience in dealing with more than 1200 clients, we have served our wide-range of services in London and across the world. With cost-effective approach in hand, DNS Accountants has offered various kinds of accountancy and other business related consulting services for companies, freelancers, and contractors. Providing diligent and highly dedicated accountants in London, Greenford, Luton, Harrow, Watford, and Euston, we aim to serve the complacent experiences to our clients across the world. Our highly qualified professionals and senior members embrace their professional degrees from well-accredited universities like ACCA and CIMA and are highly committed to serving their most proficient work to clients. Our senior members and staff are specialized in company accounting, tax investigation, tax advice, accounting solutions and other areas of consulting services to lead your business with smart growth. 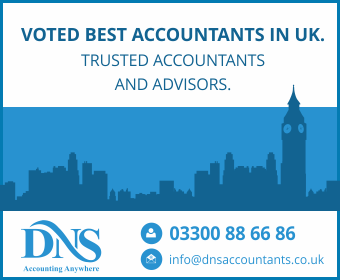 DNS Accountants are one of the best accounting services companies in the London Accountants Directory. Our timely and hassle-free services have always been enjoyed by our clients. Thereby, we always welcome and aim to opportune to serve the same to our prospective customers as well. We assure the on-time delivery of our services, and also ensure the delivery of our actions and advice complying with all the regulations and norms. Based in Bath, we help business to understand different ways of maximising their revenue and profits. Businesses will always work directly with our experienced team members, thereby building a strong, trusting relationship. By proactively managing business affairs, we offer personalised service that takes the worry out of managing finances and achieves the best tax position to suit individual circumstances. As we all know, London is one of the most important economic cities, which generates about 20 percent of the GDP of UK. London is the home of many top-notch companies which are growing their businesses at international junctures with heavy investment since a long time. It is also one of the pre-eminent financial centers in the world in the list of the important locations in international finance. Embracing a big name in attaining the major foothold in finances and investments in the world, London also has a major tourist attraction, and at present, homes to over 480 banks. London is heavily flocked with various small, medium and big businesses, but the larger part of the population works in the services industries. There are innumerous opportunities of business growth in London, in big as well as small businesses in the UK. Accountancy Services : What all do we help with? Our highly experienced professionals hold wide experience and sound knowledge of tax advisory services. Our tax accountants will acknowledge you the custom-made solutions and a wide range of tax advisory services for varied kinds of businesses. Our accountants have thorough experience in dealing with all the issues in tax planning complying with all the rules and regulations of Internal Revenue Code. Our tax accountants aim to minimize the tax liability at an individual and the company level so that tax issues at both the levels can be managed efficiently. After the end of every financial year, the company needs to have final account reports pertaining to the accurate record of all financial transactions and investments done by a company in a year. Our highly proficient accountants, who are seamless in accounting work, prepare and deliver on-time the year-end records once we have discussed all queries regarding the subject matter. We completely understand the importance of the year-end accounts for a company. Therefore, we take care of all the day-to-day bookkeeping records and work accurately on delivering it. From preparing the year-end accounts to sending and submitting it to the important organization, we take care of everything in the complete process. What do we provide in year-end accounts? We provide spreadsheets with accurate calculations as well as profit and loss account and balance sheet. We also prepare year-end accounts for registered self-employed individuals and submit it to the HMRC with their personal tax returns. Business Investment Relief is a remittance for many investment purposes. It is a special relief that is available for UK-domiciled or UK resident taxpayers who are taxed on the remittance basis in the UK. This generous tax relief allows the taxpayers to remit to the UK, tax-free, their offshore gains and income to invest in qualifying UK investments. In brief, it is a source of investor through which a business can attract many potential investors to invest in business. Our highly experienced account managers work proficiently in giving you the most lucrative advice on the same. Although, there are certain rules to define the whole procedure of qualifying UK investment and in what conditions, our account managers handle the whole responsibility of BIR with their thorough experience in the said field. Our account managers take care of all the benefits and pitfalls of BIR, and acknowledge you and guide you complying all norms and regulations on time. We, at DNS Accountants, aim to ensure every possibility of saving money for clients and fetching major investments for their businesses with the help of the proficient accountants in North London. Our dedicated and committed senior members and accountants in London provide the best of their accounting solutions in Central London, Wimbledon, Bromley, Harrow, Northolt, etc. Over the years, we have had gathered a wide and proficient experience in serving various kinds of accounting solutions by duly complying with all the norms and regulations, and always aim to continue the same in future as well.